It is easy for me to remember when I sowed the seeds that have become these unstoppable Swiss chard plants (there are two). It was September of 2010. I was pregnant and still managing the “all day” sickness as I hosted a square foot gardening workshop in my backyard. I was new to the idea, and in return for being host, I got my very own square foot garden bed. Not much took off in the bed that fall. The adjacent nectarine tree had not been pruned recently and shaded the bed too much. 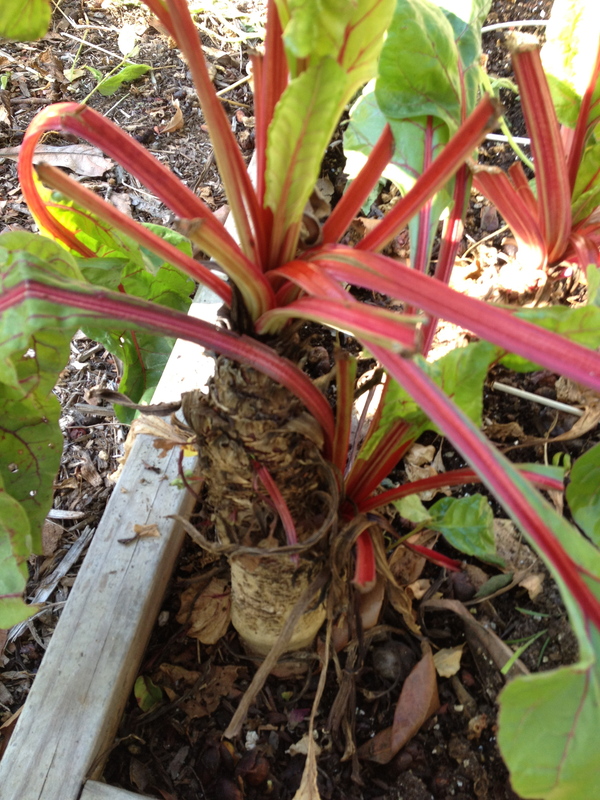 The swiss chard, however, thrived. The bed was planted the following spring, but having a newborn usurped any energy I had for the garden. Again, not much grew, but the Swiss chard kept going, and going, and going. The plants are now almost two years old and show no signs of bolting. All the other chard plants planted last fall in various other locations in the backyard bolted long ago. There must be some sort of freak micro climate in that particular corner that is tricking them into a perennial life. They are beginning to look like little trees. Growing up around the Swiss chard “trees” this spring were soup beans (Calypso and Cherokee Wax). I am not sure if I planted too early or they got some sort of disease, but the plants did not do too well. This is the harvest. Beautiful, but very small. The beans are gone and in their place I put in a late, down to the wire planting of more winter squash and a couple zucchini. We have until the end of June to do our last summer plantings. 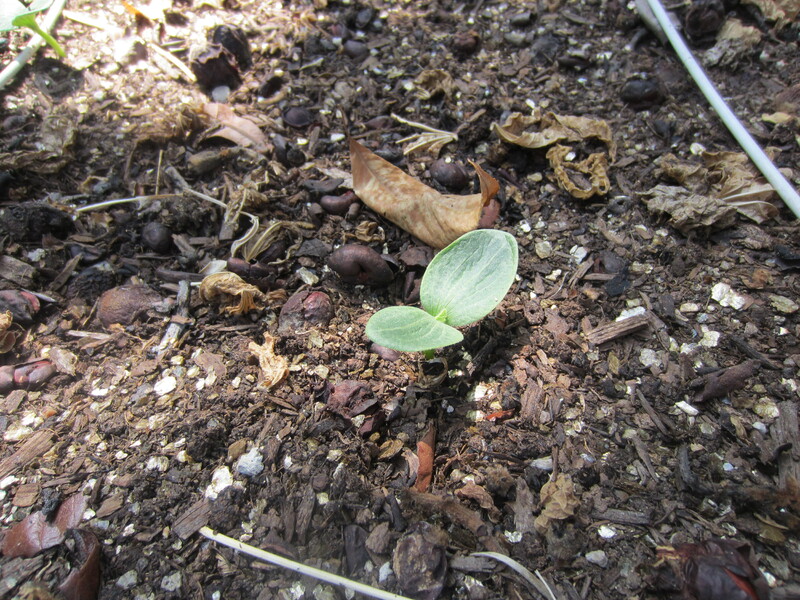 I planted the squash on June 29. We’ll see if they know I really did plant them in June, and that, yes, they do indeed have enough time to grow to maturity. They came up fast, so I am hopeful. Chard is such a lovely veg and it’s absolutely amazing to see what your two plants are doing! 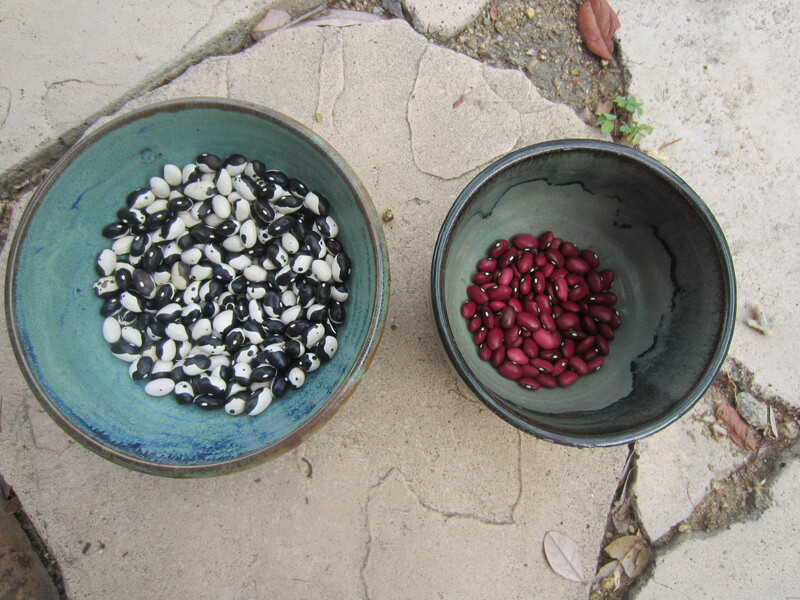 I planted Calypso beans for the first time this year and am waiting to see what we get – your beans look wonderful, even in a small quantity! Luckily, my family really likes chard. They definitely slow down a bit in the summer-winter, but grow like crazy in the spring. I feel lucky to have this year around treat! Good luck with your calypso beans. I hope they taste as good as they look!